Materials science is an hybrid entity coupling fundamental research with engineering application of the end-product. Knowing and producing are never separated. The interplay of cognitive purposes and technological interests is seen in the very definition of materials. Unlike matter, the notion of materials refers to a substance which is useful or of value for human purpose. Materials are usually defined as substances having properties which make them useful in machines, structures, devices, and products. Because of this dual aspect, materials science has contributed to a deep transformation of the overall organization of research and teaching. Whereas in 1900, it was taken for granted that there were two kinds of sciences, the pure or basic on the one hand and the applied on the other, this is no longer the case. By pursuing simultaneously cognitive and practical interests emerging disciplines such as materials science have subverted this clearcut distinction. One major objective of materials science and engineering is to create materials by design, i.e. structures tailored for specific purposes, whose properties are adapted to a set of specific tasks. This goal was achieved only once instruments provided access to the microstructure of materials. X-ray diffraction was the first of the new techniques for imaging the microworld that fostered the development of materials science and technology. Each new technique opened up new windows on the microstructures. The generic concept of materials presupposes that there is something common to such diverse things as metals, polymers, glass, or semi-conductors. All these different materials are submitted to a common approach typical of materials science. Instead of adopting a linear sequence, materials scientists and engineers have to embrace conspectually in a single approach structures, properties, functions, processes and end-uses. Do you agree with this intro? If not, go to discussions. 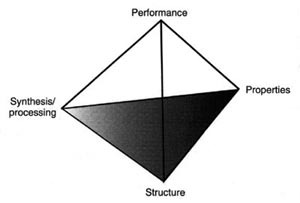 1990: materials scientists and engineers conceived of their discipline in the form of a tetrahedron, as shown on the left. 2000: materials scientists added a fifth corner to the polyhedron characterising their discipline: end users. Is MSE a coherent discipline or a multidiscipline? Is there a founder of MSE? This page was last updated on 15-Feb-2001 by Arne Hessenbruch.